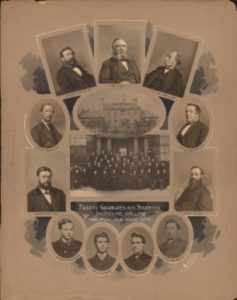 The faculty, graduates, and class of 1870. For Dalhousie’s 200th anniversary, Alice Albarda and Geoff Brown of the Dalhousie Libraries’ University Archives have created a two-part digital exhibit based on The Lives of Dalhousie, a comprehensive two-volume history of Dalhousie University written by Peter B. Waite. The goal of this project was to supplement the book by showcasing material from the Dalhousie University Archives. The Lives of Dalhousie University Volume One, 1818-1925: Lord Dalhousie’s College and Volume Two, 1925-1980: The Old College Transformed were written by Peter B. Waite, Dalhousie’s historian, from 1986-1992. The two-volume book chronicles Dalhousie’s history from Lord Dalhousie’s arrival in Nova Scotia in 1816 to the end of Henry Hicks’ presidency in 1980. The exhibit follows the format of the books, with a section for each chapter. Within each section, Alice and Geoff have selected a handful of topics to highlight. Some of the topics, like Thomas McCulloch or the Dalhousie No. 7 Stationary Hospital, are important parts of Dalhousie’s history that many people are already familiar with. However, the team tried to also select topics that were less well-known and might provide some insight into the everyday lives of Dalhousians throughout the school’s history. Each topic in the exhibit is illustrated with items from the Archives, which have been fully digitized and are also available through the Archives catalogue or DalSpace. Throughout the course of the six month project, Alice scanned material as needed and uploaded them to both the exhibit and the Archives catalogue. The material includes historical photographs, articles from the Dalhousie Gazette, academic documents, and personal mementos. The full text of The Lives of Dalhousie has been published on GitBook and is linked throughout the exhibit, so viewers can read more about Dalhousie’s history if they so desire. As a further celebration of Dalhousie’s 200th anniversary, the Dal Libraries has put together a timeline for each day of 2018 that includes many of the images found in our Lives of Dalhousie University exhibit. The timeline is our way of connecting Dalhousie to the broader community by featuring an event, historical photograph or other material for each day of 2018. With such a rich history, we had plenty of material to choose from. The timelines are being posted on a monthly basis and offer a fun, informative and sometimes whimsical view of Dalhousie’s past.